President Uhuru Kenyatta and his entourage made entry at the 12th Kenya National Breakfast (NPB) Safari Park venue just after 9am and moments later the MC for the occasion, and Chairman of the Organizing Committee, Hon. Captain Clement Wambugu took the podium to formally welcome the guests in attendance. Besides the President and his deputy, those in attendance included the Speakers of the Senate and that of the National Assembly, Governors, Senators and MPs, Judges, Cabinet Secretaries, diplomats and business leaders. The last time I had seen a gathering of so many political and business leaders in one place was back in August 2010 during both the passage of the new Constitution on August 4, 2010 and at a promulgation party at the Carnival later that month. Hard to believe it’s been almost 4 years since that jovial promulgation day but one could tell even at this somewhat solemn event that the ideals of the new constitution have yet to be fully experienced and no less than the president himself acknowledged this in his speech. Not coincidentally, however, the theme of this year’s NPB was “Doing Things Right,” and the organizers had greed and corruption in mind as among the vices especially those in leadership must do right about to eradicate or at least minimize below the current toxic proportions. Upon welcoming the guests, the MC invited Hon. Alice Chae, M.P. to do the first scripture reading, followed by Hon. Paul Koinange, M.P., who offered the first prayer. Breakfast was then served at each individual table in lieu of guests trooping to some central serving point, which whenever it happens with that many people, is an invitation for confusion and chaos, let alone wastage of time. As breakfast was being served or being had, the Parliamentary Choir took the stage and did a rendition of several songs, which was impressive as I am sure many of us present had no idea there was such a thing a Parliamentary Choir, let alone one that could sing as good as this one did. Mr. Justice Paul Kihara Kariuki, President of the Court of Appeals was then invited to offer a prayer but gave a lengthy ode mostly focusing on ethics and civility before praying. He also had some words of wisdom on being humble and told the proverbial story about a guest who goes straight and takes a place at the high table only to be embarrassed later being told to vacate the seat as the seat was reserved for someone more important than him or her who has just arrived. Justice Kariuki was apparently preaching what he doesn’t do or either that he was reminded of this as he had the audience laughing noting precisely this had just happened to him, namely, he came and proceeded to seat at the table reserved for the president and whoever else was to sit with him but apparently Justice Kariuki it was not so he was politely asked to move! Of course, as you’re being walked there, everyone’s head is turning and as you take the high seat, you’re telling yourself and everyone knows you’ve landed. Imagine the converse; you’re told to leave the High Table and head to some corner seat and on your way there and as you take the seat, you’re telling yourself and everyone is saying what a moron—okay, maybe not that harsh but you get the point. Back to the event, several other speakers took to the podium and offered their prayers, including a reading from the Quran by Hon. Dr. Abdi Nuh, Chairman of County Speakers Panel who prayed for peace and religious tolerance in the country. The Hon. Senator Naisula Lesuuda, followed with a lengthy prayer which I am sure impressed many as did me for she was not reading as the others were—at least it didn’t appear that way, yet everything she was saying in the prayer was apt, thoughtful and organized in how she delivered it. I would say it was the best prayer offered during the occasion and the best way to sum it is, if you can imagine what there’s to pray for our beloved country, she covered it. In between the scripture reading and prayers, the Moipei Sisters, a quartet I had never heard or seen before took the stage and beautifully sang several acapella songs which the audience seemed to enjoy as did yours truly, even though am usually not a fan of acapella. Nyamira Governor John Nyagarama spoke in behalf of all governors and said all leaders should be on a mission to do things right. “Let us not ask what is it that is in it for me but what is it that will help our people. Our aim is the delivery of services to the people,” he said. The Guest Speaker, former US ambassador to Kenya Scott Gration was then invited to offer his remarks. He started by basically going over his own personal journey of growth to where he sits today personally and professionally as the Vice-President of The Ibex Group, Ltd., a group dedicated to bringing international investors to East Africa. Ambassador Gration, a retired major general before serving as US ambassador, recalled a time when he nearly died while flying into San Antonio, Texas due to mechanical difficulty. He said although he had even by then had an accomplished life, he afterwards felt had he died that day, he didn’t believe he would have considered that living a full life. His life having been spared, he yearned for something more; to him, this something more became more apparent when he thought about what happens when someone dies and is buried. Noting there are two distinct dates that appear on the tombstone of anyone buried at a cemetery, namely, their date of birth and when they died, Gration further noted in between these two dates, is a dash and the dash represents something very important: our legacy. In other words, said Ambassador Gration, the dash is what we make our lives to be, meaning, what we do between the date of birth and death is for us to fill in and ultimately it’s how our contribution to society or humanity will be judged or determined. “God determines the beginning and end of life but we as humans have to decide what’s in between that beginning and end,” he said. This realization, he reiterated, became crystal clear when he became a man of faith following the near death experience he survived described above which solidified his faith in God and has since become the point of reference in everything he does. I interpreted this to mean Ambassador Gration believes putting God first and whatever endeavor one pursues is paramount as it both accomplishes one’s will and hopes while at the same time doing so in a manner that’s pleasing to God and therefore good for society at large in general and for any individual directly or indirectly affected in particular. The former ambassador said Kenya has a lot of potential because of its strategic geographic location and its hardworking citizens. “East Africa’s future is very bright and I truly believe now is the time to be flocking to Kenya and not fleeing its borders,” said he. Following Ambassador Gration’s remarks, Hon. Ekwee Ethuro, the Senate Speaker, gave his remarks that centered on unity. He said prayers “are not something we’re doing just to feel good” but “we want our leadership to know that what breaks God’s own heart breaks our hearts. We have come here to plead for those favours from God,” he said. Deputy President William Ruto then took the podium and told Kenyans that there was strength in diversity. He said despite the different religions, Kenya can progress if only they prayed together. Before inviting President Uhuru Kenyatta to give his remarks, Ruto said he had asked the president to sing his favorite childhood Sunday School song, which he said the president had agreed to but on condition everyone else joined him in singing the song. And surely upon taking the stage, the president had the entire audience singing “Blessed Assurance,” which was some experience to behold, given the joviality and easiness with which it was done. Setting aside his prepared speech, President Uhuru Kenyatta criticised the political class for hypocrisy. “If only half the people in this room, just half, just took up the messages we have been given today, this country would change within one year,” said President Kenyatta. “If we left this room today and just committed ourselves to go out and practice what has been preached here by ourselves as leaders, then we’ll have a great country and great prosperity and a great future for the people of this country,” he said. Saying “God never and never will abandon Kenya,” President Kenyatta asked leaders –and Kenyans for that matter, to reflect on their relationship with God. “God has never abandoned Kenya but maybe we have abandoned God because if half of the people in this tent just took up the messages that have been given here today, this country would change within a year,” the president said, repeating what he had just said moments earlier regarding half of the leaders present heeding the message and what that would do in terms of transforming the country in 1 year. “Let it not be that we stand here, we say great things but what we read, what we hear coming from the same leadership in our dailies, on radio stations, in public rallies…is completely contrary from what we have preached here,” he said. 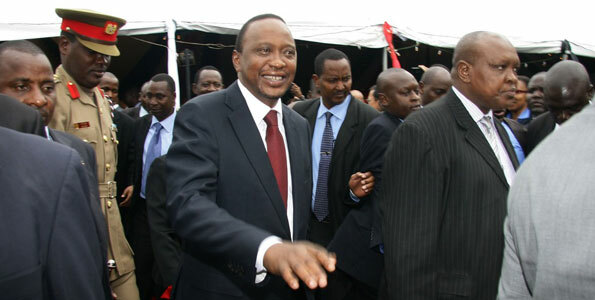 The President told Kenyans to stop divisive politics and embrace unity if the country is to progress. “Let us see all of us preach against tribalism, let us see an end to negative ethnicity and hate speech. Let us see more of working together to improve and transform the lives of Kenyans,” he pleaded to all leaders. The President asked Kenyans to end hate speech and tribalism which he said were rampant in the country. The conviction and firmness with which President Uhuru Kenyatta said this led me to believe this was not something the President was just saying for the sake of saying but it’s something he actually believes the question is are others equally willing to do the right thing? We certainly pray and hope they all are; at least that a good number of them are to make a difference in what has to happen from where we are and where we must go for the sake of peace, unity and prosperity for our beloved country.